It’s that time of the year again. I know this because half the radio stations in the area tell me every morning as I drive into work. There is enough guilt to go around Casa de Netty without some nameless twit on the radio reminding me how it’s my duty to make my family smile this holiday with wonderful gifts I should purchase at these fine stores. Here’s the deal – my parent’s have have all the material possessions they need – and then some. My kids? They have ever-changing needs – while today they may want a new toaster, tomorrow they may decide a new set of towels are in order. So my answer to it all is gift cards. I know, not a lot of heartfelt warmth in plastic, hence the scarves. Since I am relatively sure that neither of my girls would ever find this blog, I can tell you that the blue/green ones are for my youngest and her new roommate and the center is for the oldest. I need to make one more to match the center – though a bit smaller for my granddaughter. Oh and possibly another one if the one in the oven is a girl as well. 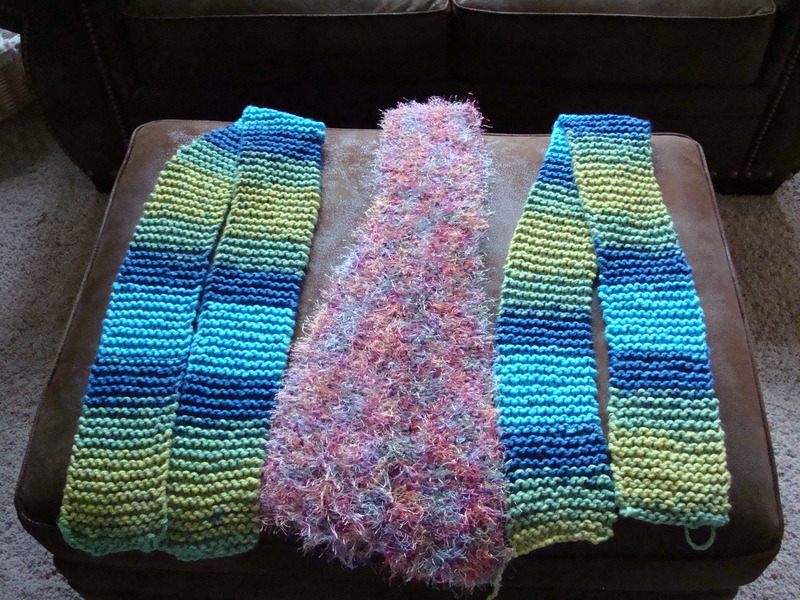 I like knitting, even though my co-worker tells me I’m to young to sit around knitting, I find it very soothing. Kind of like meditation, though instead of breathing you pay attention to the needles and the stitches. I am getting to the point where I don’t have to obsessively stare at my work – but I still need to check youtube from time to time – especially when it comes to casting off. Gotta love the information age!